Based on based on Swedish author Fredrik Backman's 2012 novel of the same name. The description of A Man Called Ove makes the film sound like the kind of film we’ve seen many times over. A grumpy old man with a painful past has to endure a boisterous young family moving in next door. However, soon enough, through flashbacks, we’re able to empathize with the man. His repeated encounters with the charming young family that just moved in next door begins to melt his icy exterior. Despite living with his pain, his loss, his regrets, and having lived long past his prime, befriending the young newcomers helps him see the continuing joy in life. Sure enough, movies like Up, St. Vincent, Grumpy Old Men, Kikujiro, and even Wes Anderson’s The Royal Tenenbaums and Rushmore feature somewhat similar story arcs. It may as well be its own subgenre at this point, but that doesn’t mean new entries aren’t welcome. Obviously breaking it down so crudely cheapens what the storytellers are trying to do here. 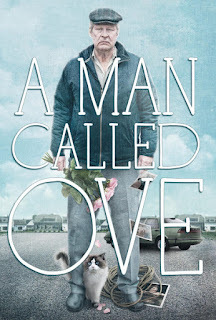 Ove (Rolf Lassgård) is an aging, ill-tempered man whose regular routine involves walking the streets of his charming little community to make sure everything is in order. He demands the people living around him keep things neat and tidy, that the gate remain locked at all times and all signage is properly placed. He continually berates residents for walking their dogs on the sidewalk or for driving their cars on the small streets that are clearly not meant for vehicles. We find out he was formerly the president of the housing community responsible for enforcing rules and maintaining the grounds. Somewhat recently he had been deposed by a longtime rival, but now that this rival is in poor health Ove continues making his rounds president or not. We also find out he’s still reeling from the recent loss of his beloved wife, and the company he worked for for 43 years also recently let him go. He lives a quiet life preferring to reflect on the past rather than engaging with those around him. When he isn’t making his rounds, he’s picking up flowers to leave at his wife’s grave, which might have been a brief moment of serene reflection if he didn’t have to argue about the price of the flowers with the store clerk. Nevertheless, he makes a point of visiting his wife’s grave on a regular basis if only to promise her that he’ll see her soon. And he might have committed suicide in order to fulfill that promise if it weren’t for the young family that just moved in next door. They repeatedly interrupt his attempts to “rejoin” his wife. But in the brief moments before he reluctantly stops these attempts we’re given flashbacks as if Ove is seeing his life flash before his eyes. They inform us of the significant life events that shaped who Ove is now. Most of them involve pain and loss, but they allow us to empathize with this curmudgeonly man and make his eventual transformation all the more satisfying. Now, that may make Ove sound like a dark, dour, joyless film, but that couldn’t be further from the truth. In fact, there are plenty of moments of joy and humor to mix up this otherwise sad film. They work together to make a film that’s more moving than depressing. Even if this kind of film is becoming more common, Ove stands out because rather than aspiring to be a buddy comedy or an ensemble, like most of the examples given, it’s a character study. It follows its central character almost to a fault. Even the most important side character, Parvaneh (Bahar Pars) - the young, pregnant mother who he befriends - lacks character development or a proper story arc. Yet it doesn’t seem to have been a detriment as it allows more time for fleshing out Ove’s past and his relationship to the community he lives in. It helps that Pars breathes a lot of life into the character despite the writing’s deficiencies. She ends up being the most likable character in the film, and she needed to be in order to effect Ove in such a profound way. They become fast friends despite their obvious differences. She reminds him of a younger version of his wife, and that opens him up to the idea of confiding in her. And Ove, being quite the handyman when it comes to fixing up a new home, becomes a valued friend of Parvaneh and her young family. I’d be remiss if I didn’t mention the effect the young children have on him. They remind him of the children he and his wife wanted but could never have. Nevertheless, the reason to watch the film is Ove himself. Rolf Lassgård turns in a moving performance that captures grief and angst due to the many losses we experience throughout life, but also the eventual joy at newfound friendships. The flashbacks are well implemented and not heavy handed. Director Hannes Holm doesn’t over stylize the film, choosing to focus on character rather than artistry. The other conflict Ove must survive to contend with is that of the “white shirts,” those controlling organizations that have plagued Ove over the years. They’ve continually pop up trying to take over his humble living spaces in order to repurpose them into more lucrative housing complexes. With them, these “white shirts” can procure a nice profit even if it comes at the cost of Ove’s homes and all the memories they hold. The primary, uplifting lesson to learn here is what the community can do together rather than relying on the efforts of one person alone. Maybe this film doesn’t break new ground, but it does what it intends very well. In fact, A Man Called Ove stands out as an example of how good this subgenre can be.